THEATER CAMP - Celebrating 30 Years! THEATER CAMP is back for its 30th season! 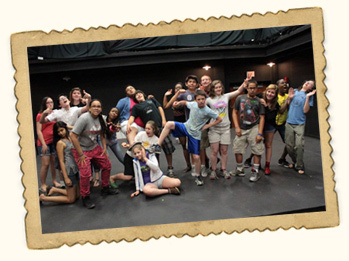 Give your kids a summer they’ll never forget at our national, award-winning Theater Camp at Middlesex County College. Eight weeks of summer fun for teens & kids entering first grade – 16 years old. Theater Camp runs for 8 weeks, June 24-August 16th with 7 performances on the main stage plus 2 performances from our “Teen Scenes”. We provide a fun, safe environment where campers can learn about all aspects of musical theater with an emphasis on building their confidence and self-esteem – and all levels of experience or no experience at all are welcome! 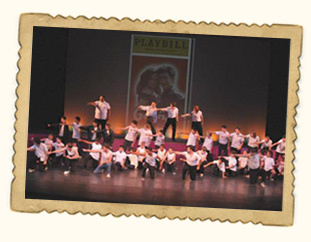 Taubenslag’s Theater Camp is held on the Main Stage of the Performing Arts Center on campus in an air-conditioned, comfortable and clean environment. 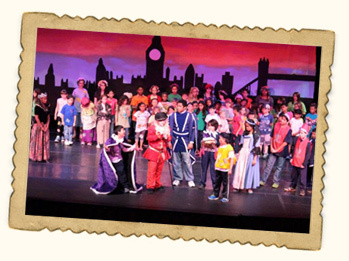 Our camp is supervised by New Jersey Teachers with combined experience of over 40 years in teaching and children’s theater so you can be sure your child is cared for with an experienced and dedicated staff. And most of our camp counselors were campers themselves; many have grown up in the program and had so much fun they didn’t want to leave! 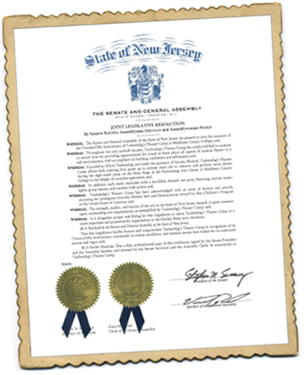 Our Theater Camp was also honored by the New Jersey Senate, General Assembly & County Freeholders for Artistic Excellence & over 25 years of service to children in Middlesex County! Our Theater Camp is a welcoming place where all campers feel accepted and form life-lasting friendships – the majority of our campers return year after year – a testament to our successful programming and professional staff. 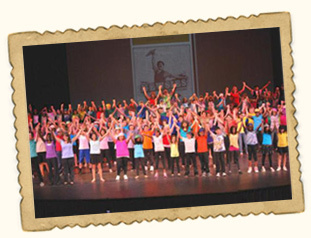 We are also so proud of the hundreds of heart-warming thank you letters from satisfied parents and kids – just scroll down to the bottom of the page for a sampling of these Theater Camp success stories to see what makes our camp as special as it really is! 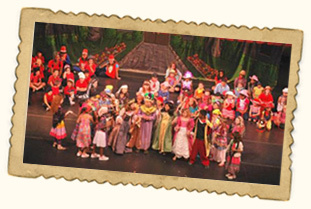 Theater Camp is available for both half-day and full-day sessions. Before and after care is also available on campus. 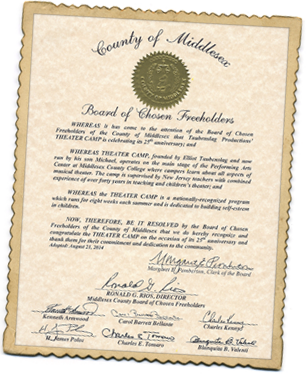 Taubenslag’s Theater Camp at Middlesex County College is an amazing, unique day camp where your child can develop their confidence and talent in a safe and fun-filled environment. Keep reading for all the details and options available. Seven Performances in Eight Weeks, Give All Kids a Chance to Shine! During the first six weeks, campers will produce an elaborate musical production EACH WEEK! Weeks 7 & 8 are reserved for the annual “Broadway Spectacular”. Roles are provided for all campers. Campers rehearse from 9 am to 12 noon, Monday through Thursday and perform their musical productions twice every Friday morning on the Main Stage of the MCC Performing Arts Center. Fridays’ shows are at 9:30 am and 11:00 am. Theater Camp is More Than Just Theater! After a lunch break, our afternoons are filled with tons of FUN activities, including swimming every day, scavenger hunts, tie dye, charades, sing down, relay races, carnival, Mardi Gras, outdoor games, arts & crafts, theatrical workshops, dances and much, much MORE! During our last week of the summer we divide campers into teams for our popular Color War! 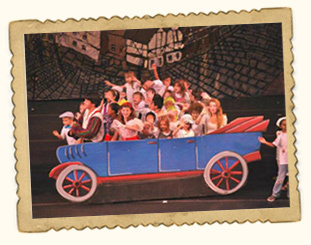 Taubenslag's Theater Camp provides the best of what you would expect a day camp to offer – our unique method of building kid's self-esteem and confidence with performance and theater arts training is set in an exciting, fun-filled camp environment! Click here to check out some of the fun photos from Theater Camp. Fridays are truly fantastic at Theater Camp! First, our campers perform for a packed audience on the Main Stage of the MCC Performing Arts Center. Two shows are held every Friday at 9:30 am and 11 am. After lunch and a quick dip in the pool, there's always a fun-filled cast party to celebrate the performance and cap off the week’s activities. Cast parties are complete with current music, lights, group dances and contests with prizes. And each week the cast party is themed, such as monster mash, rock star day, Halloween dance, pajama party, dress as your favorite superhero, beach bash party and Theater Camp prom. 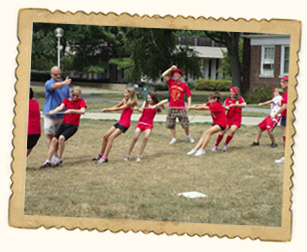 It all adds up to a summer camp experience full of excitement and fun. Full-day campers in Session III will get to experience the magic of seeing a professional show in NYC; some for the very first time! 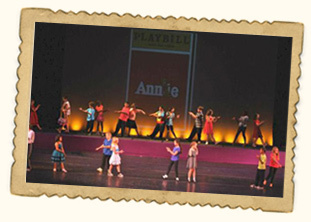 Theater Campers will take a field trip to see a BROADWAY show – an exciting and memorable experience for ALL! Some of the shows being considered for this year's trip include Aladdin, The Lion King, Frozen, Wicked, Tootsie, Kiss Me Kate and Beetlejuice, just to name a few. The chosen show will be announced in the Spring. 1 – 2:00 pm Outdoor Recess (weather permitting). Supervised age-appropriate outdoor activities such as kickball, Frisbee, freeze-tag, four-square, puzzles and guitar sing-a-long; playing outside, enjoying the day! 2 – 3:00 pm Swimming in College’s Olympic-size indoor pool. 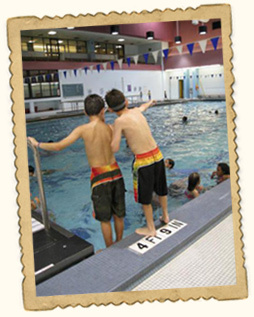 All children are required to pass a swimming test if they choose to swim in the deeper diving area. 3:30 – 4:30 pm Fun activities or theater workshops. Activities include advertise a product, carnival, flashlight sing-a-long, etc. Workshops include audition prep, improv techniques, dance instruction, stage make-up and more. Instead of rehearsing and performing in the weekly shows, we also offer campers the option to participate in “Tech”. 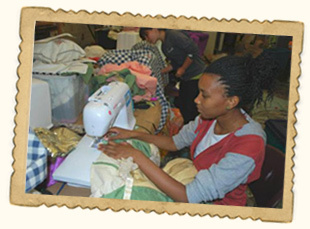 From 9 am to 12 noon, Tech campers paint scenery, organize props, and sew and design costumes. During performances, Tech campers function as the stage crew, making sure that sets, scenery, props and costumes are in place. This is an option that requires maturity and the ability to follow direction – perfect for learning what a crew does to make each theatrical performance a success. Teenagers at THEATER CAMP have the option to perform in the Main Stage musicals every week or join “Teen Scenes”. In Teen Scenes, they will rehearse with their peers for 3 weeks, learn more advanced theater and acting techniques and work with scripts. At the end of Session I and Session II, a “Teen Scene” show is performed for parents, community members and all Theater Campers. Teenagers who choose not to perform work as Production Crew – building & painting scenery, operation the spotlight & sound boards, and Stage Managing the Teen Scenes production. Also during each of the regular Friday performances, those in Teens Scenes will act as ushers and theater managers, giving them the opportunity to develop new skills. We expect all teens that are privileged to participate in this special program to adhere to the program rules and be ready to work each and every day. Are you interested in earning recommendations from camp directors, adding skills to your college application and becoming a member of the Theater Camp Staff in the future? If so we have a Counselor in Training Program designed to give you the skills needed in order to be an excellent counselor in the future – while you continue to perform and participate in our theatrical productions and have FUN in all Theater Camp activities. 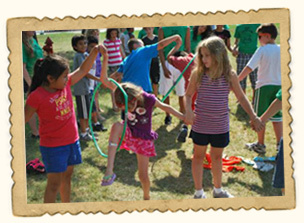 With our CIT program, emphasis is placed upon developing leadership skills, communicating with children, team building, assisting with workshops and participating in fun camp activities while shadowing counselors and staff. As a CIT you will be responsible for a variety of tasks such as coordinating a group or program activity, directing a song or scene, choreographing a dance number or acting as Main Stage Theater staff on show days. CIT’s are also encouraged to participate in Teen Scenes. CIT's are expected to remain for the full day; 8:30 to 4:30, every day of the sessions they register for. Although CIT groups are primarily made up of former campers the program is open to anyone who is qualified. If you think that your unique experiences and abilities could enhance the experience of our Theater Campers, then apply for the CIT program. Our Junior Counselor program gives former CITs between the ages of 16 and 18, the chance to return to Theater Camp in a role that allows them to gain further leadership experience and hands-on training, while relating to peers and supervisors in a work setting. Junior Counselors serve as a role model for Theater Campers, assisting with camp activities and serve as leaders in camp spirit and motivation with a “you can do anything” attitude. Junior Counselors provide positive leadership, guidance and are responsible for assisting Counselors with all tasks including the supervision of Theater Campers, having knowledge of the whereabouts of each assigned camper at all times, maintaining good public relations with parents and college staff and acting as Main Stage Theater staff on show days. In the Junior Counselor role, you will continue to grow as a mentor while adding to your job hunting resume or college application and increase chances for future Theater Camp employment. JCs are expected to remain for the full day; 8:30 to 4:30, for the full summer. 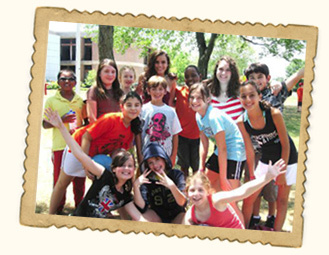 We are one of the most fun and affordable Summer Theater Day Camps in all of New Jersey. Our full 8 week program is the best and most economical way to give your child a summer they’ll never forget. Feel free to compare our competitive pricing and options. Includes Trip to NYC to see a Broadway show! *A savings of $320 from per session pricing, available to campers who enroll upfront for the entire 8 week program. Half-Day, Monday-Friday, 8:30 am – 1:00 pm = $295. CITs must register for a minimum of 2 sessions. Admission is by application only. To qualify to be a CIT, you must be at least 15 years of age or entering sophomore year of high school. As a CIT, you should possess leadership qualities and conduct yourself as a good example for campers. It is important that you have endless enthusiasm, individual maturity, moral character, team qualities and communication skills. All CIT applicants must write a letter to our director, Michael Taubenslag, detailing these skills and experiences and reasons for wanting to be a CIT at Theater Camp. APPLICANTS MUST INCLUDE HOME PHONE NUMBER AND EMAIL ADDRESS. Accepted applicants will be personally notified by Michael Taubenslag. All letters should be emailed to theatercamp@optonline.net or michael@taubenslagproductions.com. JCs must register for the full summer. Junior Counselor fee is $100 per session. Admission is by application only. To qualify to be a JC, you must be at least 16 years of age or entering junior year of high school. JCs must have an understanding of how Theater Camp works and because of this must have at least one summer of experience as a Theater Camp CIT. JCs must have shown some leadership ability and use of sound judgment, a demonstrated patience and desire to work with children, a positive outlook and enthusiasm for the Theater Camp program and ability to be a positive role model for campers. It is important that you have endless enthusiasm, individual maturity, moral character, team qualities, and communication skills. All JC applicants must email our director, Michael Taubenslag, for specific registration information. INCLUDE YOUR HOME PHONE NUMBER AND EMAIL ADDRESS and send to: theatercamp@optonline.net or michael@taubenslagproductions.com. When you are ready to sign your child up, registration is an easy process and handled directly by Middlesex County College. Register in person at Crabiel Hall, Room 110, located on campus nearest to Parking Lot #1. Be prepared to bring your child’s immunization records. 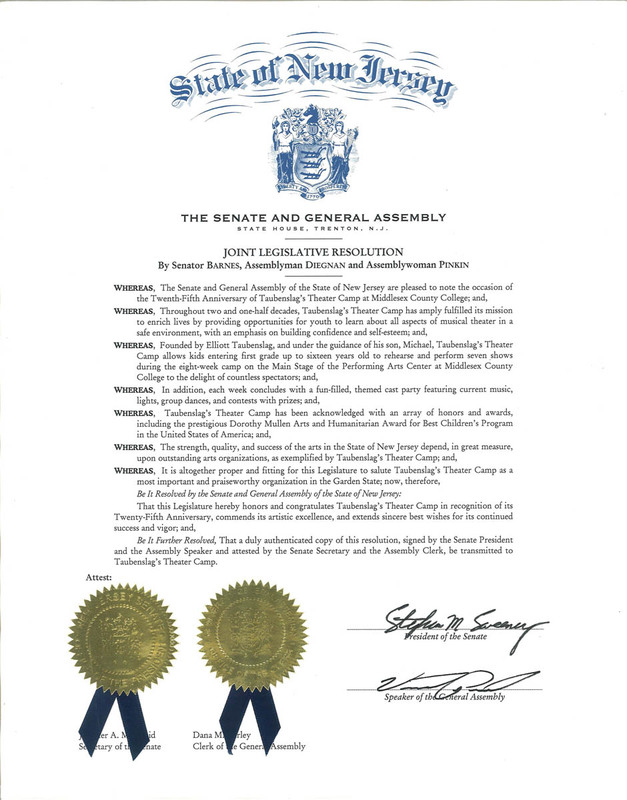 Middlesex County College is located at 2600 Woodbridge Avenue, Edison, NJ 08818. You may also register via mail by sending payment and health forms to Middlesex County College, Crabiel Hall, Room 110, 2600 Woodbridge Avenue, PO Box 3050, Edison, NJ 08818-3050. Forms may also be faxed to MCC at (732) 906-2521. Payment can be made by check, money order, Visa, MasterCard or Discover. 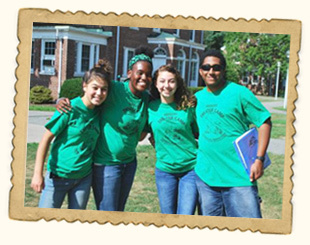 If you have questions about camp registration, call MCC at (732) 906-2556. 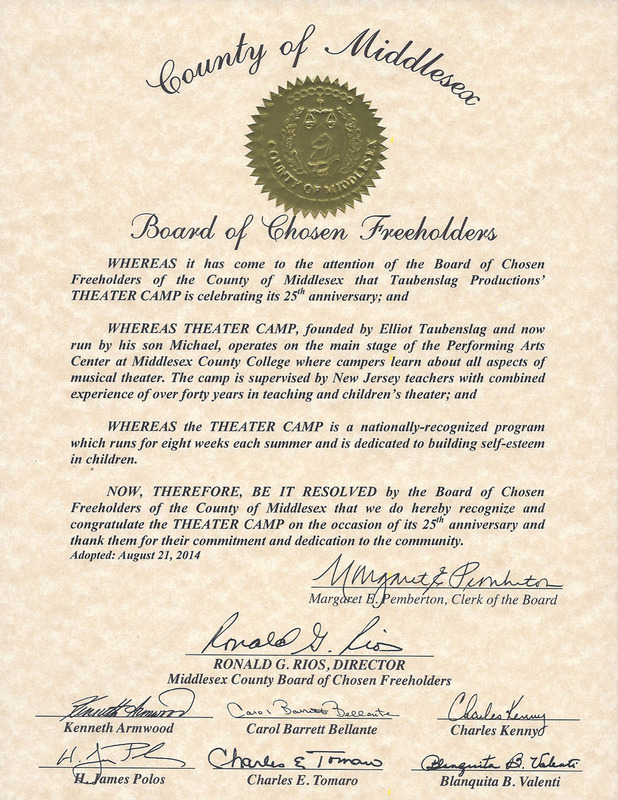 If you have any questions about Theater Camp and its activities, call Taubenslag Productions at (732) 422-7071. 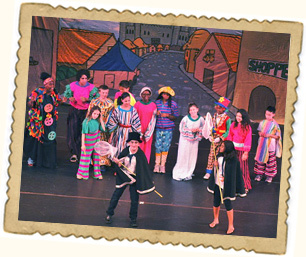 You're invited to join in the fun and attend Taubenslag's Theater Camp performances at Middlesex County College! 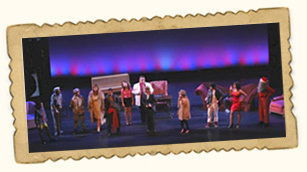 Every Friday Taubenslag's Theater Campers perform their musical productions on the Main Stage of the Middlesex County College Performing Arts Center. Our shows are always open to the public. 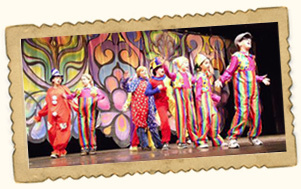 All productions have scenery, colorful costumes and many special effects. It’s fun & exciting for children of all ages! There are 6 shows to choose from – attend 1, 2, 3 or ALL! Shows are performed every Friday at 9:30 am and 11 am. Each show is approximately 1 hour. Tickets are only $3 each and sold at the box office located in the lobby of the Performing Arts Center. Box Office opens at 9 am on show days. Only cash is accepted. Lots #1 & 4. So come on out, see a great show and help support our Theater Campers. You are sure to have a wonderful theater experience! Neighboring camps and schools are also invited to attend ALL of our shows. This is a unique opportunity to add a field trip to your summer curriculum – bring your kids to a live theater show – parents will love it and your kids will love it even more! If you want to bring your camp or school to see a performance, just give us a call to reserve your show tickets in advance. Remember its only $3 a ticket to see a live performance. Call us today to RESERVE seats or let us know if you need for more information. Kids Succeed at THEATER CAMP! “This is Srihari’s 4th year in Theater Camp and he enjoys every bit of it. Srihari has been a late talker and since his speech came late his social skills and his auditory and receptive comprehension skills have been delayed. We decided to introduce him to Theater as a series of studies on the arts and education revealed a close link between Theater and the improvement of a variety of verbal skills, including significant increases in story recall and understanding of written materials.First time when he came to the Theater Camp, he was shy, anxious and lonely. Today, he wants to audition for every role. Theater has helped Srihari gain highly effective experiences in developing speaking and listening skills. This is one place where he is never judged. Success and pride and camaraderie, often so very illusive to kids with learning delays, are among the many benefits Srihari found in the Theater Camp. A dream come true perhaps for a lonely child who ached to be part of something wonderful and realized his potential. Thank you for giving Srihari the love, encouragement and a belief that “if he tries hard, he can do anything in life”. “I began attending Michael Taubenslag's Theater Camp in 1996 when I was just 6 years old. 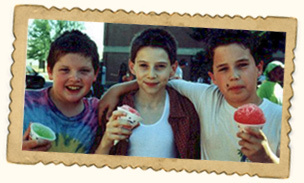 I was a camper every single summer until I was old enough to become a counselor in 2006. The eleven summers I spent at Theater Camp are still to this day some of my fondest childhood memories. 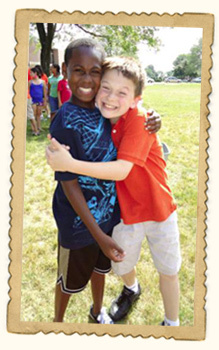 I not only established lifelong friendships at camp, but also learned the value of teamwork. Michael's camp was the first place that I was able to work together with children my own age towards a common goal and experience the fabulous feeling of success and accomplishment every Friday morning as we performed our shows for full houses of cheering children and parents.The summer that I served as a member of the staff, I really grew to understand how much I was influenced by my summers at Theater Camp. As I watched my campers discover the joy of performing, forge relationships and begin to grow and find themselves, I realized that is precisely what my eleven summers had done for me. I credit my passion for theater to Michael Taubenslag and the wonderful program that the Taubenslag family has been offering the community for decades. As a professional actress now living in NYC and pursuing theater as a career, I can safely say that my summers with Michael at Theater Camp instilled in me a love for theater and performing that I will never be without. THANK YOU, MICHAEL! I want to thank you for another wonderful summer! This is my daughter’s 2nd summer with your program. She has truly blossomed and gained self-confidence thanks to all of your hard work. You have a wonderful staff that is devoted to making each child feel special. It is a comfort to know that Marissa is well taken care of each day. We’re looking forward to next summer! There are not enough words to express my gratitude and joy! This is my daughters’ first year of camp and they wished it would never end! Thank you for your hard work, passion and dedication as well as your awesome staff! We hope to see you next year and many more! Thanks for such a memorable summer! Just wanted to pass on some interesting nice news. A friend of mine works at Sacred Heart School in South Amboy. She told me a story about this young boy who was in a school play recently. He’s very cute, shy and not at all forward. Apparently he was the hit of the play and everyone was surprised! She said after the play everyone wanted to know how he pulled it off and the father said all the credit needs to go to the Theater Camp at Middlesex County College and Michael. He sent him here to the summer camp last year to help him over his shyness and to gain confidence in himself, apparently it worked. That EVERYONE matters, because even the 55th dwarf can get a laugh! As parents, we cannot think of better lessons our son Noah could have learned and taught us in his first year at MCCC Theater Camp. Like him, we have been looking forward all year to another summer of great experiences, fantastic performances and new lessons for all of us. His registration for 2013 is in the mail!